We can't get enough of the Empire cast. You definitely can't knock their hustle, their drive and their talents. This cast works hard and putting in work with individual projects or performances. Serayah McNeill who plays Tiana Brown on Empire will be a part of a diva trio on an upcoming VH1 special. Serayah McNeill is a diva! VH1 Divas first started in 1988 and has been on a four year hiatus. This year, the divas return with VH1 Divas Holiday: Unsilent Night. Serayah will be performing along side JoJo and BeBe Rexha. The trio is set to become pop music Charlie Angels; performing legendary Darlene Love's "All Alone on Christmas. 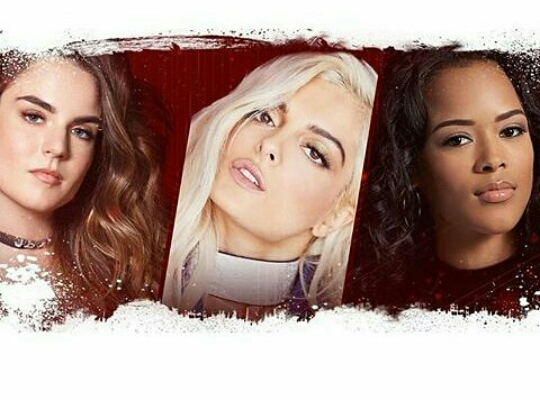 VH1 Divas and Charlie Angels: JoJo, BeBe Rexha and Serayah McNeill. In addition to Empire, Serayah starred as Dilemma in Taylor Swift's fierce "Bad Blood" music video. Check out the video below. It's a honor that Serayah will be center stage as a VH1 Diva performer. You can't miss this moment. Catch Serayah on VH1 Divas Holiday: Unsilent Night on Monday, December 5, 2016 at 9pm on VH1. Please be the first to like, comment, and share. Subscribe to sueboohscorners.com for your Talk TV to Me of your favorit shows.